Alfred Bruce Hanshaw1,7,8,9,10,11 [Bruce Hanshaw4,6,12,13]. Born Jan 17 18891,2,3,4,6,7,8,10,11,14,15,16,17 [Jan - 18909], Clay County, West Virginia1,2,3,4,6,7,8,10,11,14,15,16,17. Hanshaw, Alfred B., head-of-household, age 20, born in West Virginia; parents born in West Virginia; first marriage, married 2 years; occupation: farmer, general farm; owned farm (free). Hanshaw, Allie W., wife, age 19, born in West Virginia; parents born in West Virginia; first marriage, married 2 years; 1 child, 1 living. Hanshaw, Stella W., daughter, age 3 months, born in West Virginia; parents born in West Virginia. Hanshaw, Alfred B., head-of-household, age 31, born in West Virginia; parents born in West Virginia; owned home; occupation: manager, farm. 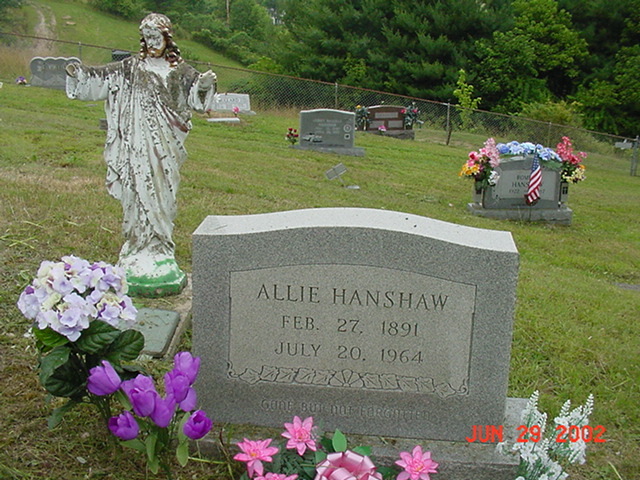 Hanshaw, Allie, wife, age 28, born in West Virginia; parents born in West Virginia. Hanshaw, Stella W., daughter, age 10, born in West Virginia; parents born in West Virginia; attended school. Hanshaw, Leamond W., son, age 8, born in West Virginia; parents born in West Virginia; attended school. Hanshaw, Wana W., son, age 4 years 8 months, born in West Virginia; parents born in West Virginia. Hanshaw, Homer J., son, age 2 years 5 months, born in West Virginia; parents born in West Virginia. Rogers, George A., brother-in-law, age 27, born in West Virginia; parents born in West Virginia; single. 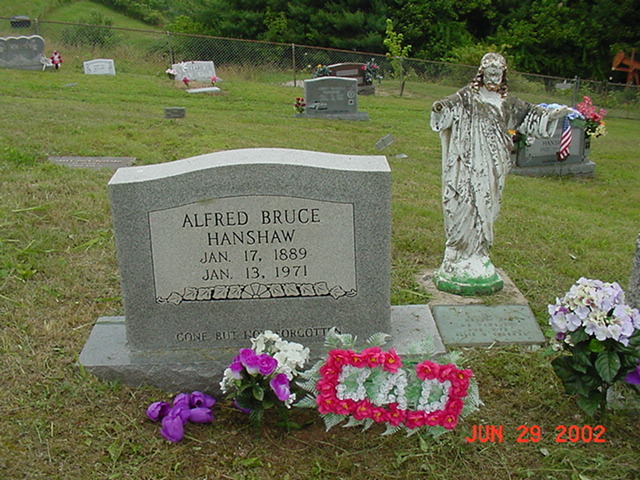 Hanshaw, Bruce, head-of-household, age 41, born in West Virginia; parents born in West Virginia; first married at age 19; owned home; no radio in home; occupation: farmer, general farm; not a veteran. Hanshaw, Allie, wife, age 39, born in West Virginia; parents born in West Virginia; first married at age 17. Hanshaw, Stella, daughter, age 20, born in West Virginia; parents born in West Virginia. Hanshaw, Leland, son, age 18, born in West Virginia; parents born in West Virginia; occupation: farmer, general farm; not a veteran. Hanshaw, Wannie, son, age 15, born in West Virginia; parents born in West Virginia; attended school. Hanshaw, Homer, son, age 12, born in West Virginia; parents born in West Virginia; attended school. Hanshaw, Gilberta, daughter, age 10, born in West Virginia; parents born in West Virginia; attended school. Hanshaw, Romie, son, age 7, born in West Virginia; parents born in West Virginia; attended school. Hanshaw, Lona, daughter, age 5, born in West Virginia; parents born in West Virginia. Hanshaw, Hazel, daughter, age 3, born in West Virginia; parents born in West Virginia. Henshaw, Bruce, head-of-household, age 51, born in West Virginia; completed 5th grade; on Apr 1 1935 was living in the same house; owned farm ($2000 value); occupation: farmer, own farm. 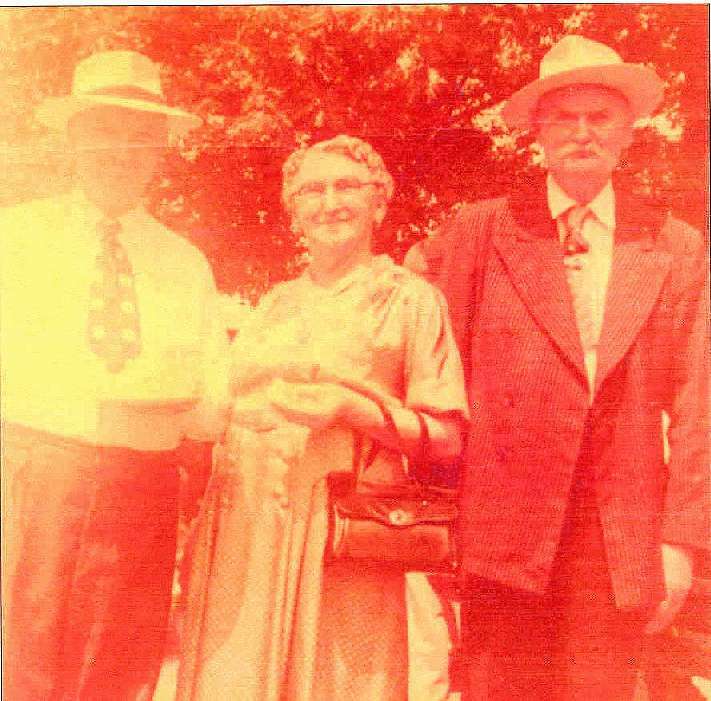 Henshaw, Allie, wife, age 48, born in West Virginia; completed 5th grade; on Apr 1 1935 was living in the same house. Henshaw, Wanie, son, age 24, born in West Virginia; completed 4th grade; on Apr 1 1935 was living in the same house; occupation: new worker; seeking work. Henshaw, Lona, daughter, age 17, born in West Virginia; parents born in West Virginia; completed 7th grade; on Apr 1 1935 was living in the same house. Henshaw, Hazel, daughter, age 12, born in West Virginia; completed 4th grade; on Apr 1 1935 was living in the same house; attended school. Henshaw, Maysel, daughter, age 9, born in West Virginia; completed 3rd grade; on Apr 1 1935 was living in the same house; attended school. Henshaw, Alice, daughter, age 5, born in West Virginia; on Apr 1 1935 was living in the same house. 1910 census, Henry District, Clay County, West Virginia; roll T624-1678, ED 2, page 275D, line #64, dwelling #102, family #103. 1910 census, Henry District, Clay County, West Virginia; roll T624-1678, ED 2, page 275D, line #67, dwelling #103, family #105. 1920 census, Clay County, West Virginia; roll T625-1949, ED 28, page 12B, line #88, dwelling #207, family #209. Photo courtesy of Randy Fitzwater ().